FILA enters the second quarter of the year with the brand new Zero Dark Pack (00:00). The pack features three iconic basketball silhouettes: the MB Mesh, a tennis mid and a slide. The inspiration is derived from the 24-hour clock, most commonly used in military and medicine fields. As FILA continues to update the Heritage silhouettes with premium materials, the Zero Dark Pack (00:00) features two hero versions of the MB Mesh. The MB relaunched three seasons ago and in the time since, the shoes have been released primarily in original colorways. The MB Mesh boasts a combination of materials on the shoe’s upper. 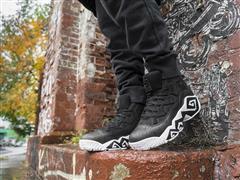 The black colorway, meant to represent midnight, is dressed in leather and embossed mesh on the upper. The blue colorway pays homage to that point in time when the night skies begin to work towards daylight. This colorway was also designed with an embossed upper, but in a premium suede option instead of leather. Both styles feature the MB’s iconic-signature midsole design. Additionally, tonal FILA branding appears on the upper, tongue, vamp and back counter, and the pair sits atop a white rugged-rubber outsole. The T-1 Mid anchors the Zero Dark Pack (00:00), with another nod back to the theme of military time. The mid-cut tennis silhouette was designed with a white leather upper, with logo and branding in a sycamore green. The gum outsole provides the perfect finishing touch. In keeping with the same train of thought, FILA offers the Drifter Slide, also in the white/sycamore/biking red colorway. The MB Mesh retails for $100 in men’s sizes and $60 in kid’s sizes. The T-1 Mid retails for $80 and the Drifter Slide retails for $30, with both silhouettes offered in men’s sizes. The Zero Dark Pack (00:00) will be available on FILA.com, beginning on April 7.